“We call this Chemical Alley,” Melanie Oldham informed me as I climbed into her car at the Holiday Inn Express, where she had agreed to pick me up and show me around Freeport. She waved to the row of budget hotels built for plant visitors across the highway from Dow and BASF. Because of prevailing winds, pollution tends to settle here, she said. 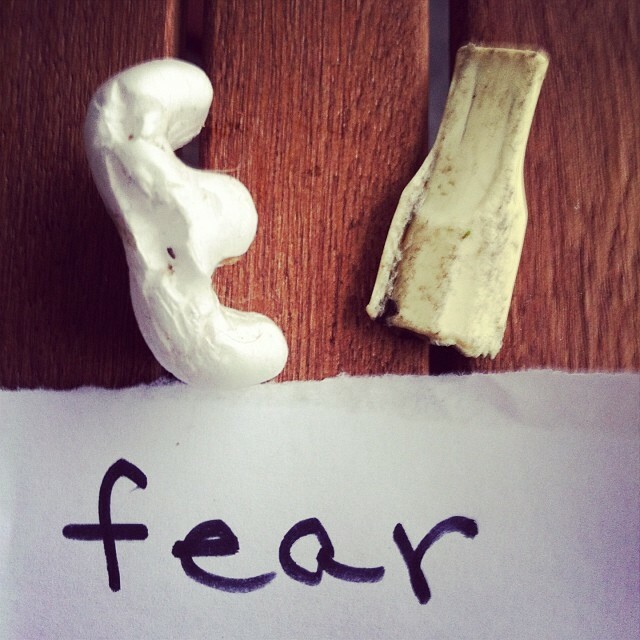 I’d been noticing an acrid, sweet smell since I arrived. 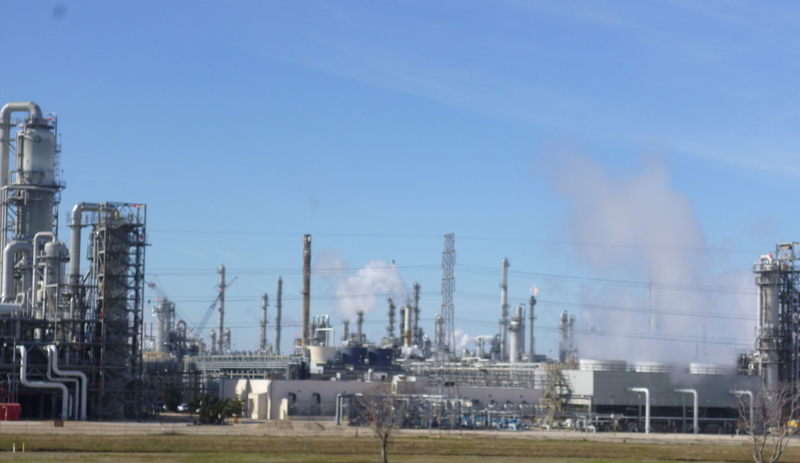 Freeport sits at the southern end of Brazoria County, which regularly ranks among the top in the state for smog pollution, despite its small population—325,000, compared to 4 million in Houston’s Harris County directly north. 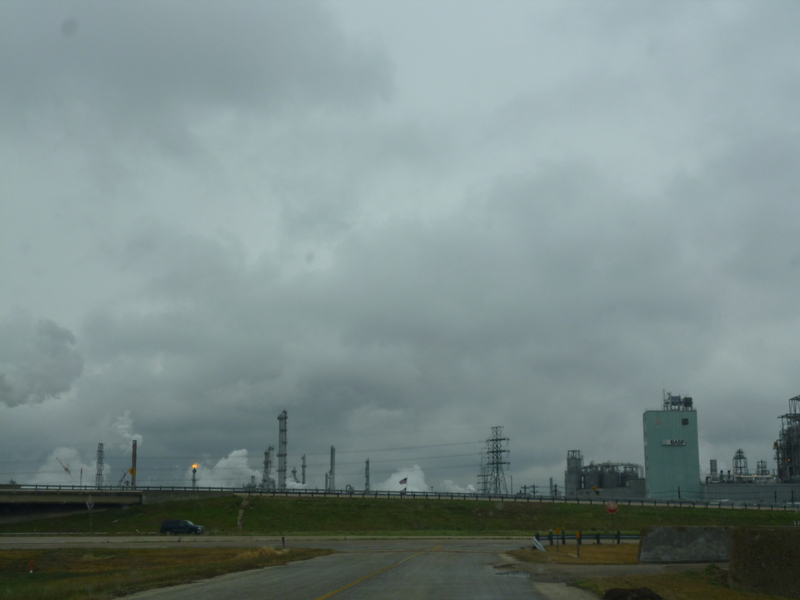 Twenty percent of all the toxic chemical releases in Texas happen here, according to the Environmental Protection Agency (EPA), from 42 facilities. Melanie had driven directly here from Houston, where she spent the day at an EPA “listening session” on improving the safety of chemical plants. She waited for six hours to say her piece. 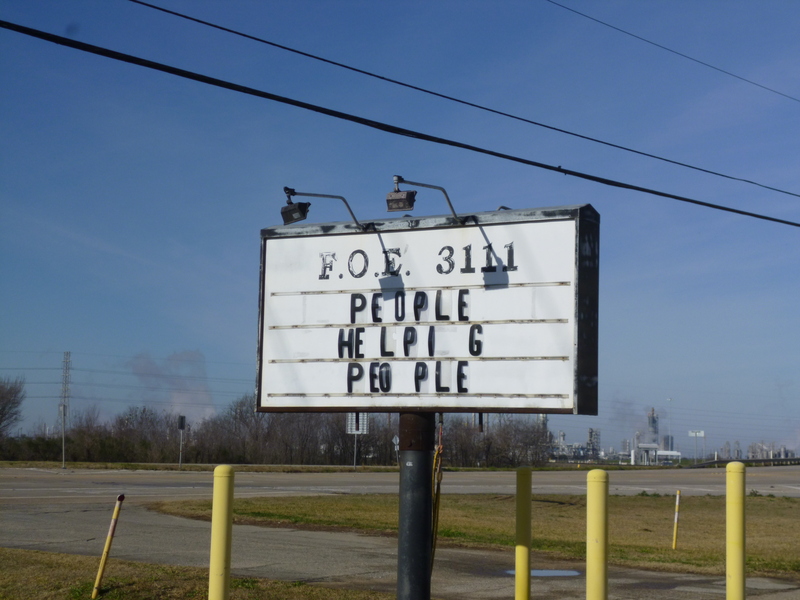 I expected her to take me past the factories, but she headed in the opposite direction, north ten miles to Lake Jackson, the town Dow built for its employees in the 1940s as it ramped up production of magnesium for the war. At the historical museum that afternoon, I learned that Alden Dow, son of the founder, designed the town’s wandering, tree-lined streets as a “city in a park.” It took a massive effort to clear the wet, bottomland “jungle” of live oak and Texas palm. Melanie drove me past the Brazos Mall, biggest in the county, to Lake Jackson Farms, an exclusive subdivision where chemical company executives live in neo-colonial mansions along a horseshoe shaped lake. Nearby lie the ruins of the Jackson plantation. Abner Jackson built a fortune here in the nineteenth century, exploiting the labor of slaves to produce sugar. Around the time the Jackson plantation reached its zenith, an expedition of Texans set out to murder the last of the Karankawa Indians, who had survived three hundred years of colonization and warfare in the region. They were declared extinct in 1858. Melanie took a quick loop along sweeping lawns and gated drives lined with live oaks, then headed south on 288, also known as the Nolan Ryan Expressway. We drove past chemical plant after chemical plant as the sun began to set. I pointed to a great blue heron slowly flapping across the road. Birds abound in the region’s salt and freshwater marshes. 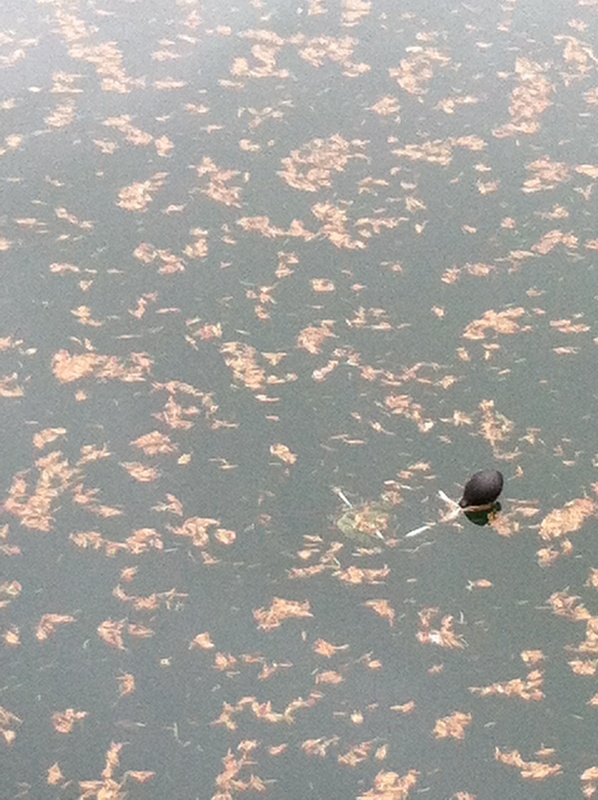 A Dow parking lot is home to one of the largest black skimmer colonies on the coast. The birds nest on the ground, undisturbed inside Dow’s gates. Once a year the company opens the lot for public viewing. As Melanie drove, she talked. About the problems the town faced from pollution. About her history. 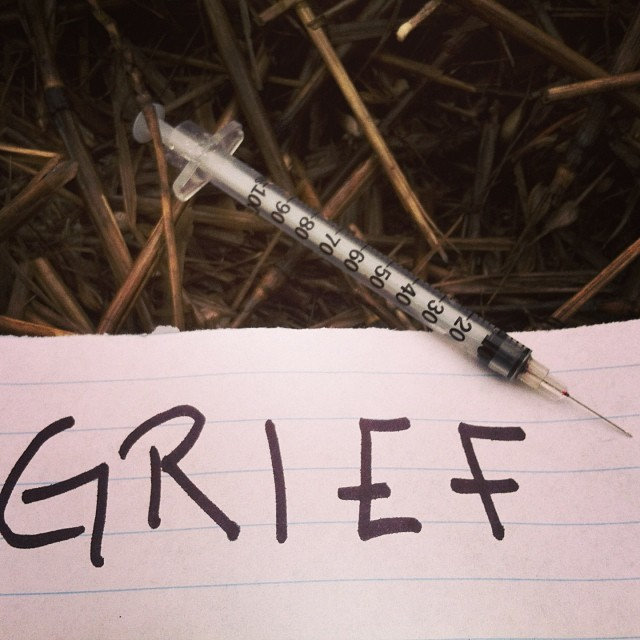 She was married to a Dow chemical engineer for twenty-three years and raised three children in Angleton, another bedroom community north of here. Things she heard about pollution from the plants nagged at her, and over the years she started to get involved. In 2006 she formed Citizens for Clean Air & Clean Water in Brazoria County. In 2012 she moved to Freeport, where the plants’ blue collar laborers and contractors live, many of them immigrants. We exited the highway and entered the town. 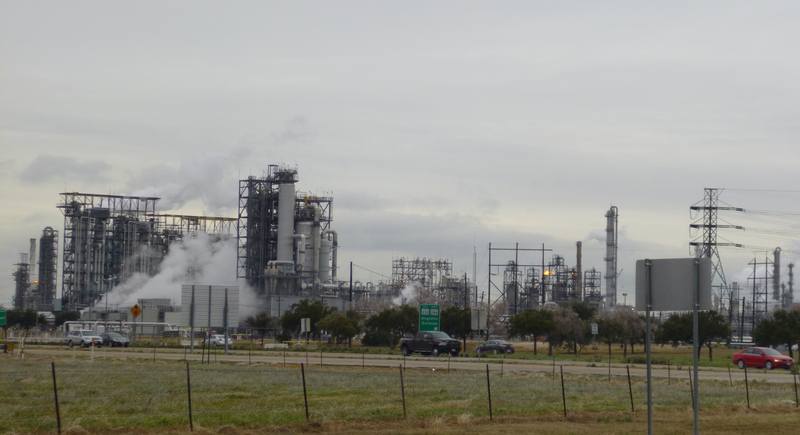 She pointed out Brazosport High School, which a USA Today study ranked among the worst schools in the nation for exposure to toxic air pollution. Boys in football gear practiced on the field as we passed. She talked about the long struggle with Gulf Chemical, a Freeport company that illegally dumped toxic waste into the Brazos River for decades. 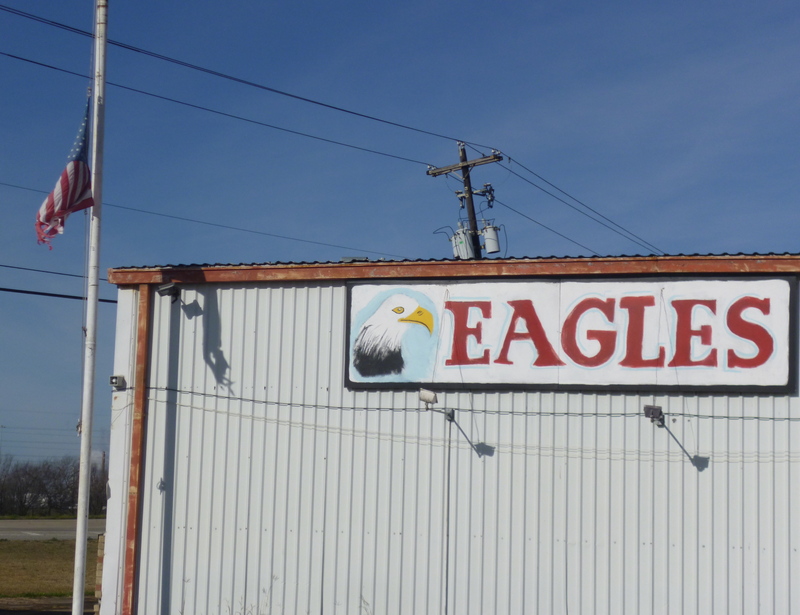 The company faced a $1.3 million fine, but a week before I arrived, the state ruled that a loophole in Texas law required capping the penalty at $300,000. Locations of schools in Freeport. Chemical plants are in red. By the time she dropped me back at the Holiday Inn Express in Chemical Alley it was dark, but I felt like I still hadn’t gotten a sense of the plants. 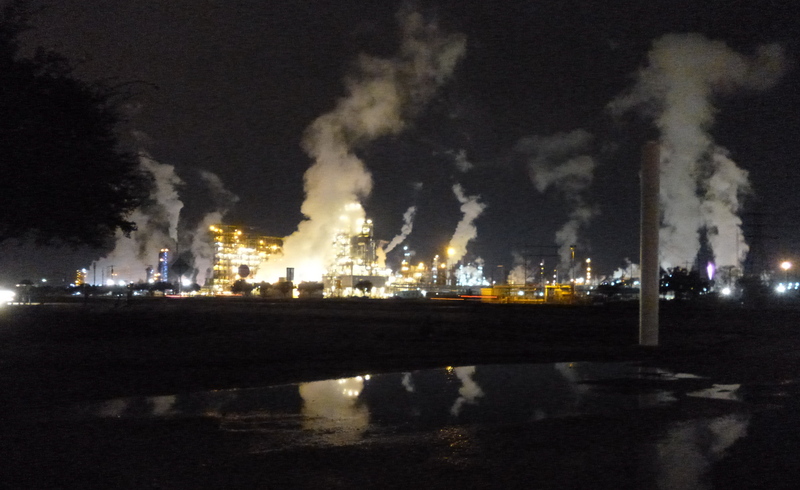 Even here, in the heart of the petrochemical industry, it all seemed inaccessible, abstract. So I got in my little rental car and started driving. The Nolan Ryan Expressway was designed to speed the commute from workers’ homes in Lake Jackson to the plants, and there were few exits. The old road went directly past the plants, but it had no shoulder; the only side roads led into the plants themselves, toward floodlights and security gates. There seemed no safe place to stop, so I found myself driving the same highway clover leaf over and over, looping slowly past them, like massive ships alight in the dark, steam and flame billowing out of their stacks. 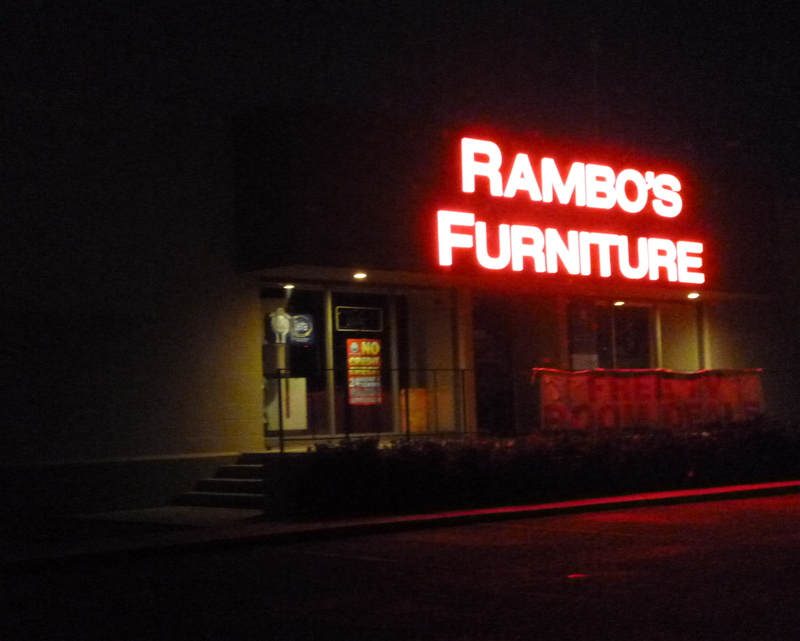 After several loops I happened onto a side road that led past Rambo’s Furniture (no credit check, 24 month financing). The far side of the parking lot, partly flooded, seemed like the best vantage point across the highway. 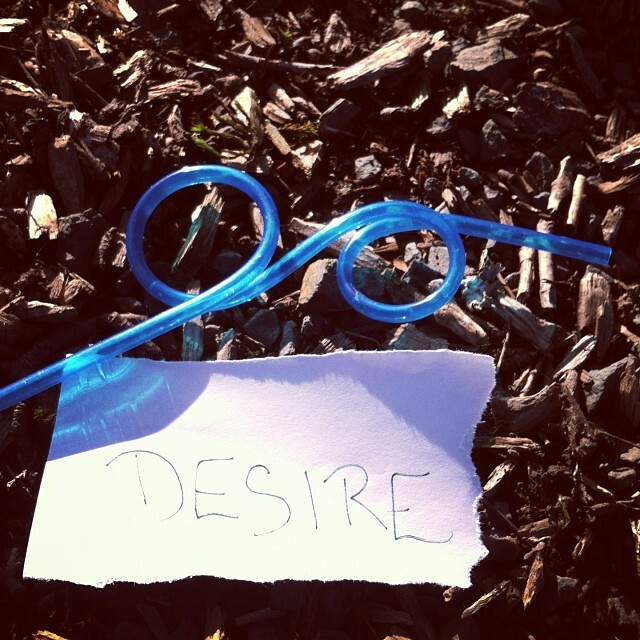 I sat for a long time in the cold with the window down, just looking, breathing, listening. The first hint that I was getting close to Freeport was the steam. Big billowing clouds rose into the cold, grey skies above Highway 288 south from Houston. 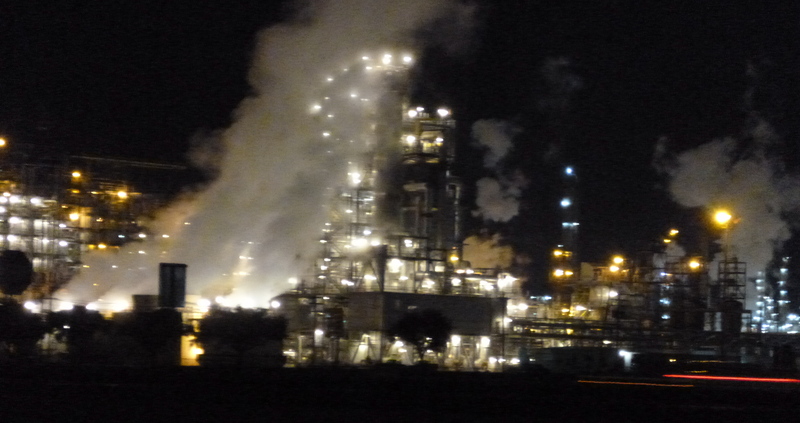 Then I came over a rise and got a glimpse of it — a vast chemical complex, the largest in North America — less individual facilities than entire landscapes, pipes and towers and stacks smoking and steaming and shooting columns of flame into the sky. 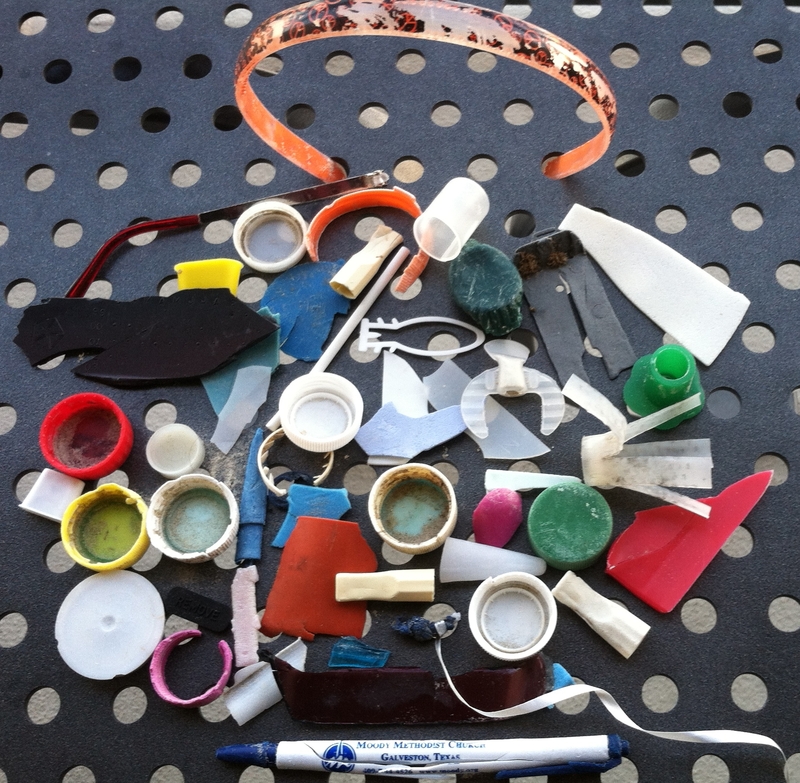 This is the land where fossil fuels turn into plastic. 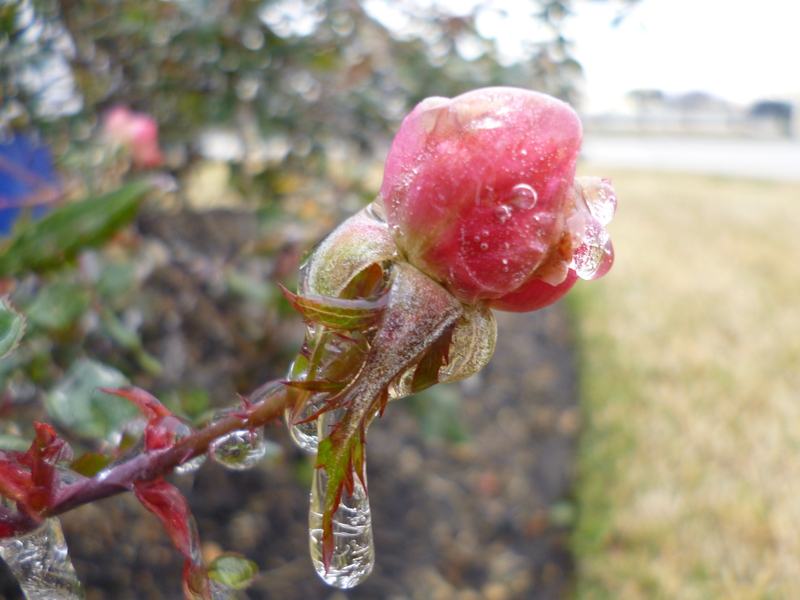 I arrived in the middle of an ice storm — a rare event in this Gulf Coast town, where the average annual temperature is 70°. 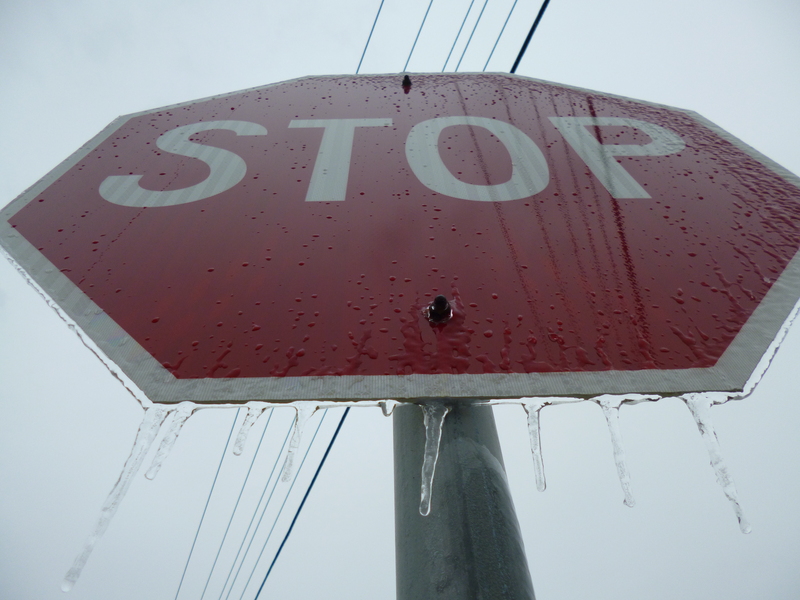 Houston had been a tangled mess of accidents and closed roads, the highway south largely deserted. In Freeport, the weather seemed not to have registered. Cars and trucks flowed in and out of factory gates, and the plants hummed on, as they do, twenty-four hours a day, every day. They hummed, literally. 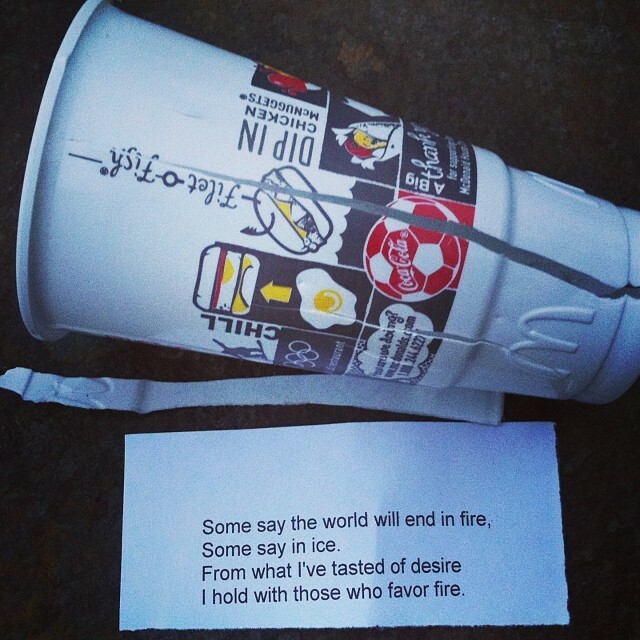 A low roar overlaid by a high-pitched machine whine permeated the town. 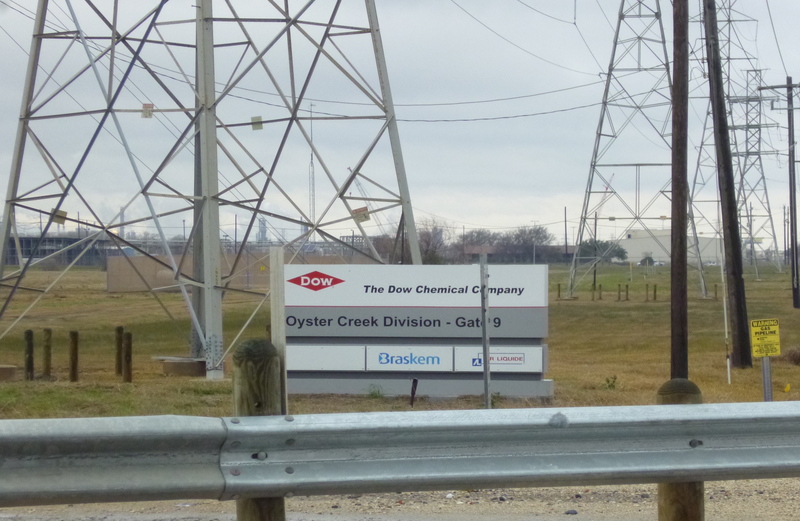 I veered off the highway and found myself at a gate to Dow Chemical’s Oyster Creek Division. Aside from manufacturing plants, only two other buildings appeared on the main road past the plant. 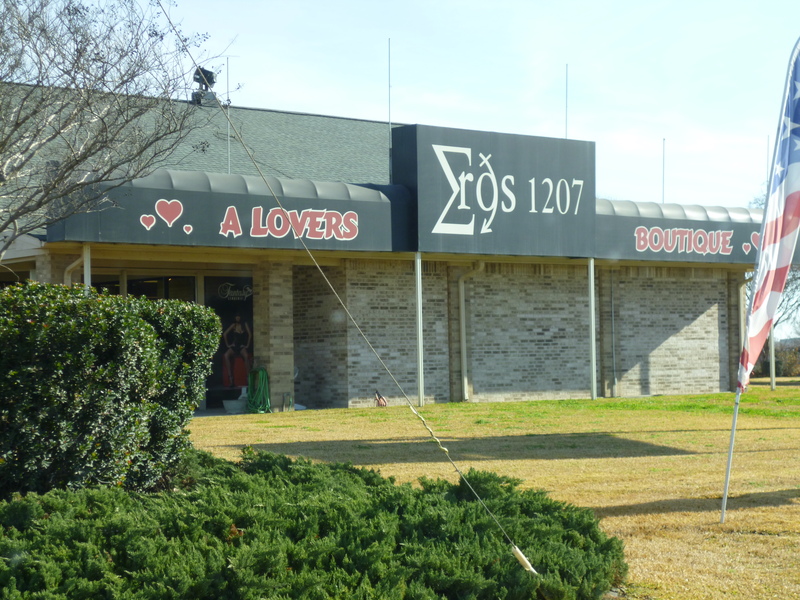 Eros, a Lovers Boutique and the Eagle’s lodge. 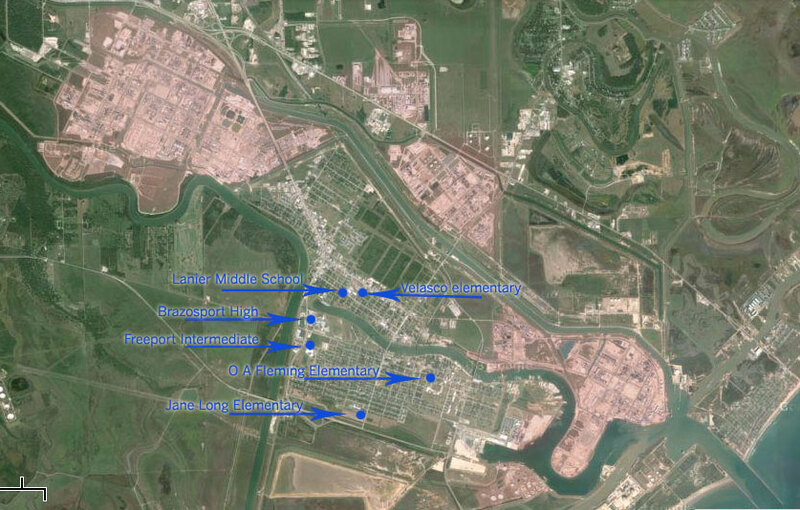 In Freeport, 12,000 people live amidst bays, marshes and bayous at the mouth of the longest river in Texas. The Spanish, who showed up here in the 1500s, called it Los Brazos de Dios, Arms of God. Today it is just the Brazos, pronounced with a flat Texas a and a short o. Chemical complexes curl around the town to the north and east. Dow arrived first and remains the largest, seven thousand acres of plants producing billions of pounds of chemicals and plastics every year—nearly half the company’s U.S. production. And Dow is expanding, building a chlorine plant, a new “world-scale” propylene plant and increasing capacity at an existing ethylene cracker. This is part of a larger renaissance in the chemical industry across the Gulf, fed by cheap natural gas fracked out of rock. It was difficult in Freeport to just wander. The roads kept dead ending at factory gates or water. I took another side road and found myself on a narrow gravel drive on top of a levee, no place to turn around, surrounded by bayou. I decided to abandon wandering and head to the local historical museum ten miles north to orient myself. If you are anywhere near Houston between now and 10 May, you must go to the (free) Blaffer Art Museum at the University of Houston to experience the installation by Antena cofounders Jen Hofer and John Pluecker. 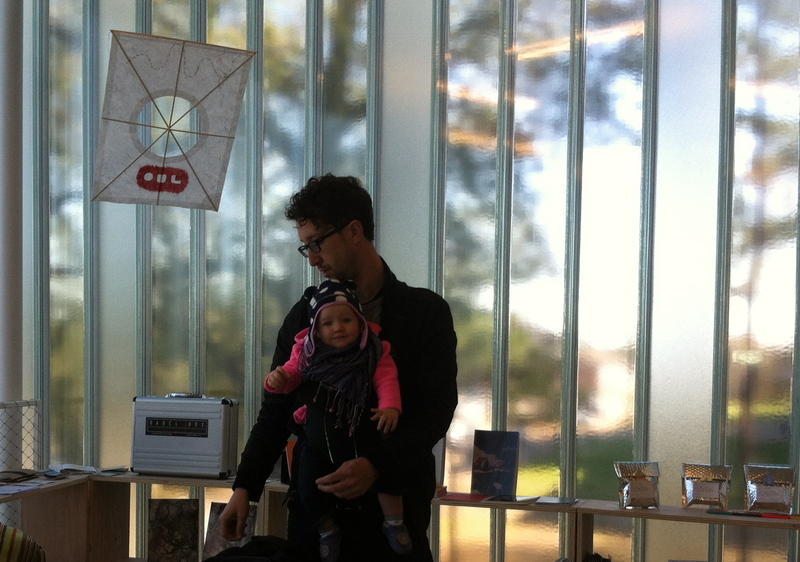 Antena cofounder John Pluecker and daughter Elena, with kite by Sueyeun Juliette Lee, and behind him in silver envelopes, jacob’s ladder books by Stalina Villarreal and Jorge Galván Flores. Antena @ Blaffer brings together hundreds of small press and DIY books from across the U.S. and Latin America. I can guarantee you have never seen such a wide and vibrant scope of community-based literary endeavor, from U.S. stalwarts like Green Integer and Kelsey Street to cartonera books from Argentina, Mexico and Uruguay, handmade from recycled cardboard. The scope of literary work represented here is thrilling. 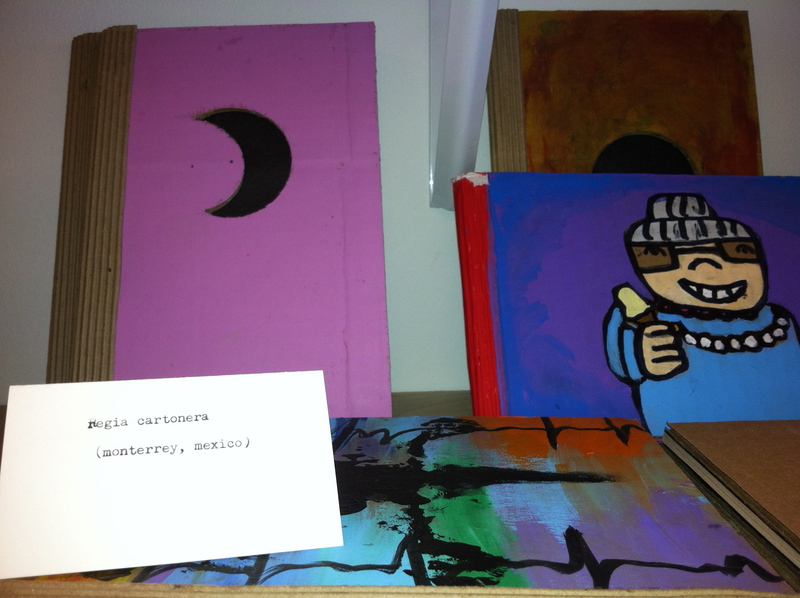 It represents Jen and J.P.’s deep dedication and committed labor in support of cross-cultural artistic production. But that’s not all. Antena @ Blaffer also gathers text-based visual work from U.S. and Latin American artists, including Garrick Imatani and Kaia Sand (Portland, OR), Cecilia Vicuña (New York/Santiago) and many others. The visual works will grow and evolve throughout the exhibition, which is more like a happening, and includes a free weekly workshop, a weekend encuentro with all the artists, and readings. 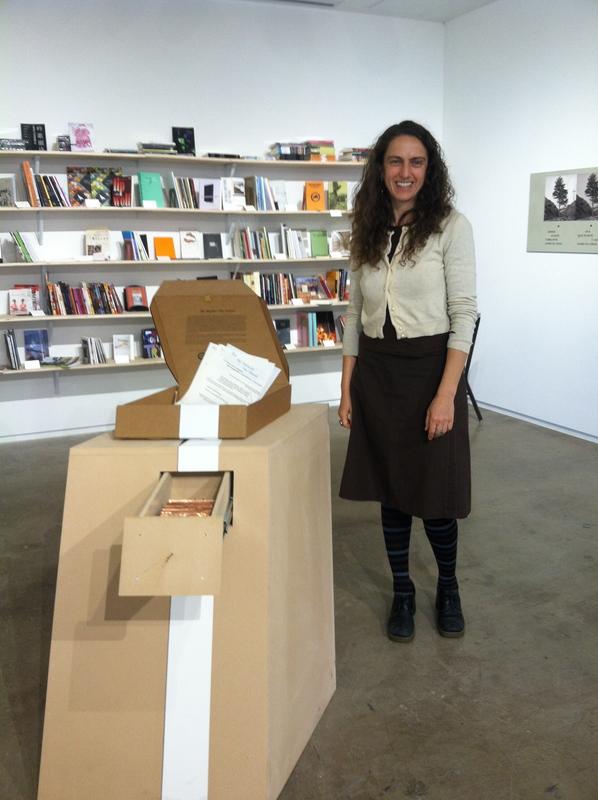 Antena cofounder Jen Hofer with the Watcher Files, a work by Garrick Imatani and Kaia Sand. This flickr set gives you a small idea of what Jen and J.P. have gathered, in a space beautifully curated by Blaffer fellow Amy Powell. I’m totally in awe of them. You will be too. This is video of a reading I gave at the San Diego Museum of Art standing among the Pastrana Tapestries. All four measure 12 by 36 feet. What a back drop of conquest against which to read about a cemetery and plastic! My gratitude to the amazing Lorraine Graham for having me there.